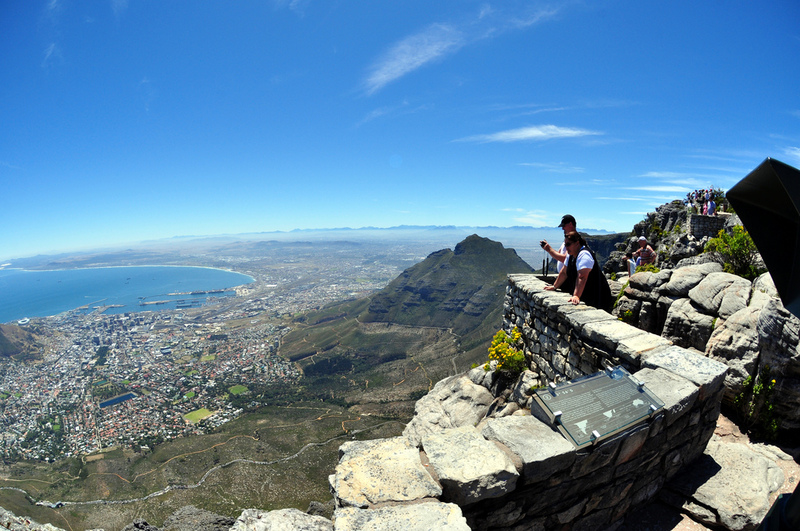 Discover the vast natural beauty of the Table Mountain National Park in Cape Town, South Africa. This world heritage site draws 4.2 million visitors a year and boasts majestic mountains, beautiful beaches and sparkling seas. Stretching from the north of Cape Town down to the southwest tip of Africa, it will take you a few days to explore the 22,000 hectare park. The iconic, flat-topped Table Mountain provides a magnificent backdrop to the bustling city below. Table Mountain was originally called Hoerikwaggo (Mountain in the Sea) by the indigenous Khoisan people of the Cape. Offering hikers a range of easy to challenging routes, visitors can choose to ascend to the top via Platteklip Gorge or take a leisurely stroll through the green landscape below. If you’re not up for exercise, hop onto a revolving cable car that will take you straight to the top. The 1,086 meter summit offers breathtaking 360-degree views of the Cape Peninsula and the sprawling city below. Lion’s Head, the mountain peak to the right of Table Mountain, was named for its shape resembling a lion lying down. The peak forms its upright head while Signal Hill forms the body of the animal. Both Lion’s Head and Signal Hill offer magnificent views of the Atlantic seaboard and is the perfect spot for viewing the sunset. You can also hike to the top of Lion’s Head via a popular trail. Cape Town’s famous beaches, characterized by bleached-white sand and azure seas attract hundreds of people year-round. Regardless of if you’re into suntanning, swimming or surfing, Cape Town has a beach for you. Along the Atlantic seaboard you’ll find the popular Camps Bay, Clifton and Llandudno beaches while further south are the quieter beaches of Noordhoek, Scarborough and Kommetjie. Inside the Cape Point Nature Reserve there are wild and more secluded beaches on both the Atlantic and False Bay sides, all of which are popular for surfing and other water-based activities. The Cape Point Nature Reserve is situated in the southern section of the Table Mountain National Park. An outdoor enthusiast’s paradise, the reserve boasts 7,750 hectares of rich fauna and flora, sheer cliffs, wild coves and spectacular sea views. Cape Point, the highest section of the reserve, is the main attraction known for its old lighthouse and panoramic views. The point is accessible via the Flying Dutchman funicular or on foot. 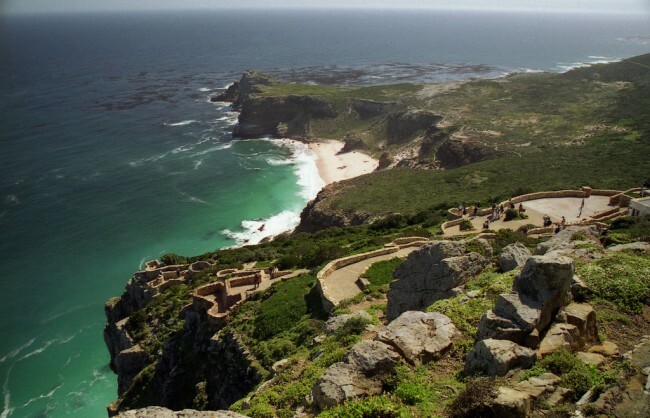 Cape Point offers many opportunities for hiking, surfing, fishing and picnicking. Visitors can also grab a bite to eat at the Two Oceans Restaurant that overlook the ocean. The Table Mountain National Park is rich in floral biodiversity. The Cape Floral Kingdom forms part of the TMNP, making it the smallest yet richest of the six floral kingdoms in the world. It covers 78,555 kilometers, spanning the Western and Eastern Cape. Most of the region is covered in fynbos, a distinctive shrub land endemic to the southern tip of Africa. Fynbos consists of 9,600 plant species of which 70% is not found anywhere else on the planet. In 2004, the Cape Floral Kingdom was named a Natural World Heritage Site. The most well-known place to see the Cape’s fynbos is at the Kirstenbosch National Botanical Garden. Boulders Penguin Colony in Simon’s Town is home to an endangered land-based colony of African penguins. 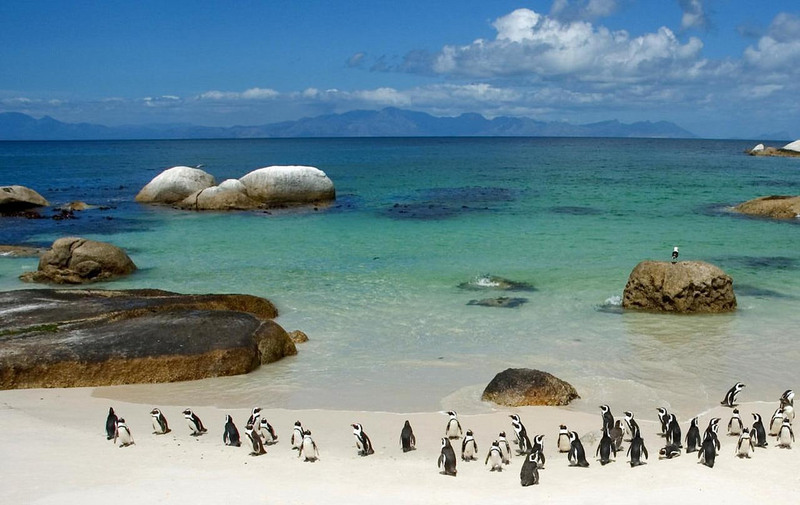 Here visitors are able to swim at the sheltered Boulders Beach or walk along elevated boardwalks to the penguin viewing area at Foxy Beach, which is reserved exclusively for the penguins. The area is home to over 2,000 penguins that settled here in the 1980s. The Silvermine Nature Reserve is located in the central section of the Table Mountain National Park. Stretching from Tokai over the mountain to Noordhoek and Sun Valley, the park boasts stunning fynbos landscapes and offers outdoor activities like hiking, mountain-biking, bird watching and picnicking. The western section of the park contains a 19th century reservoir that can be reached via a boardwalk. A stroll through one of Cape Town’s lush Afromontane forests is a relaxing and magical experience. Afromontane is a term used to describe the plant and animal species common to the mountains of Africa — think cool, shady paths, overhanging branches and tree canopies creating an otherworldly scene. The most popular forest walks include Newlands Forest, Orange Kloof in Hout Bay, and Echo Valley and Spes Bona on the Muizenberg Mountains. TMNP offers numerous picnic and braai (barbecue) spots around Cape Town. In the summer months, picnics and braais are a favorite South African pastime and what better way to do so than surrounded by nature. From picturesque beach locations like Buffels Bay and Oudekraal to leafier forest locations such as Newlands and Perdekloof, Cape Town has it all. For the more adventurous visitor, the TMNP marine protected area offers various diving opportunities, including shipwreck sites and several breeding and nursery areas for marine species. Popular dive sites include the SS Maori wreck off Hout Bay, Oudekraal on the Atlantic Seaboard and Miller’s Point in False Bay.